Finding the Local IP Address of a Linksys router is useful when accessing the router’s web-based setup page. This will identify what IP address to type in the address bar, in case you forgot your router’s IP address. NOTE: If you have forgotten your Router’s Password and having difficulties accessing the web-based setup page, try to reset your Linksys Router. For instructions, click here. Determining what IP Address to type on the web-browser’s Address bar when accessing the router’s web-based setup page. Assigning a Static IP Address on a computer to determine what IP range and Default Gateway to assign the computer. Connect the computer to any of the Ethernet ports on the router, and then proceed to the steps below. 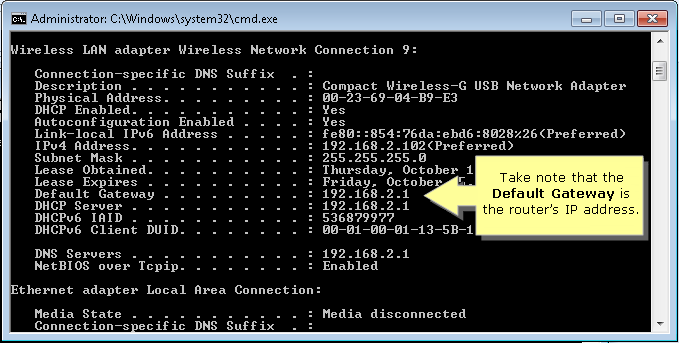 To get an IP Address automatically, you have to check the TCP/IP properties of the Ethernet Adapter installed on the computer. For instructions, click here. To find a Linksys router’s Local IP Address, check the IP settings of the computer. For instructions, follow the steps below. Click the Pearl button located at the bottom left corner of the screen. On the Search programs and files field, type “command prompt” and then press the [Enter]. When the Command Prompt window appears, type “ipconfig/all” then press [Enter]. Take note that the Default Gateway is your router’s Local IP Address.